Y’all know I love me some Pioneer Woman. And I put my money where my mouth is. Not as a gift for my mother or best friend (I do love you guys, though). It did sit on my ‘wish list’ at Amazon for about 2 weeks before I actually bought it. But I finally, actually did. And I can’t wait to get my grubby little hands on it. 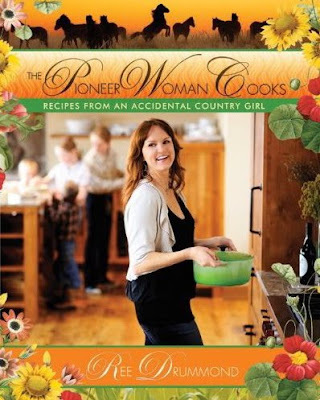 Today is the official release of The Pioneer Woman Cooks: Recipes From An Accidental Country Girl. I might have to buy a couple more, for back up Christmas gifts. I mean, who wouldn’t want a book that combines commentary that makes you laugh out loud, stunning photography and crazy delicious food? If you’d like to win one (or five!) of The Pioneer Woman Cooks, and a limited edition KitchenAid Mixer, head on over to her post here. There are only 31,675 other commenters, all hoping to win. Pretty decent odds, I’d say. Hey, I am one of those 31,000! I have tried to win many times on her blog, but alas, I never win. :) It sure is fun to try. So fun! I can't wait to get my own copy. 🙂 She's coming to my city to sign the books in November…I will SO be there! Now there are 31,676 thanks to your hot tip. 🙂 Thanks! I JUST got my cookbook in the mail today….LOVE IT!!!! Gotta go raise that number! Thanks for hte heads up!! Those are still better odds than the lottery and this entry is free! did you see her story in the Southern Living Magazine? I was like WoW! very cool! It was a very nice article. I'm one of those 31,000 too..even though I DID buy my copy today and am headed upstairs to read it NOW! How is it that I do not know this woman? I think I live on a deserted island! I like to cook…I'm gonna check her out…cause if I can cook AND be entertained…well, that makes me happy! I am the Community Manager for AdoptionVoices.com–the rapidly growing adoption social network. To join, simply go to http://www.adoptionvoices.com and click on the "sign up" box in the top right corner. Not sure of your email address so I'm sharing updated info on "Dani" (Waiting Child) Pearl S. Buck, here. I also want to share with you that she is adorable.. I will forward you a picture via email, fyi. I really hope to find this sweet little girl a home. **UPDATE** An update received on August 11th indicated that, although she is still developmentally delayed, Danni has been making progress. She is now able to crawl, sit, and stand with adult support. She can feed herself finger foods but needs assistance with other foods. She is able to hold a pencil and draw lines. Danni can say “Mama,” “Baba” (daddy), and “Jiejie” (sister). She also can imitate what’s said to her. She is able to understand and comply with adult instructs (i.e. handing items to the adult). Danni also appears to understand facial expressions and understands what “no” means. I want this soooo badly! I keep trying to hint at it to my husband, but he hasn't 'gotten it' yet. Sigh. My cookbook arrived yesterday and I spent HOURS last night flipping through it and marking recipes to make. I LOVE it! I just got my copy the other day!! Love it…haven't made anything yet that my family doesn't like!! !